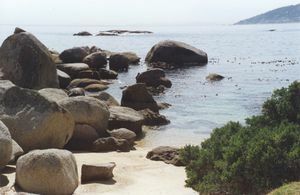 The dive site Klein Pannekoek is an inshore rocky reef in the central Oudekraal area on the Atlantic seaboard of the Cape Peninsula, near Cape Town in the Western Cape province of South Africa. About 570m at 212° magnetic to the north cove at the Table Mountain Natonal Park Oudekraal site. Very large granite corestone outcrops and boulders, Some overhangs, crevices and small caves. Best after south-easterly winds (offshore). The swell should be low, though a bit of white water on the outer reefs is normal. There is usually some surge, and it can be quite strong. Limited off street parking with fairly good security, Clean, neat toilet facilities, Fresh water showers and taps, picnic sites (no fires permitted), shade, seating, garbage cans, a nice little beach and pleasant and protected snorkelling areas for beginners. 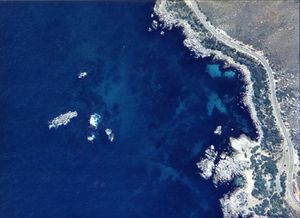 Boat dive or shore dive with a long swim (570m). 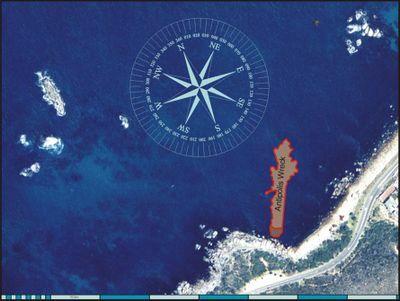 It is about 15km from Hout Bay or 13km from Oceana Power Boat Club at Granger Bay. Shore dive: Parking as for Coral Gardens. Go down the stairs at the west end of the parking lot and across the grassy area then turn right to the small sand beach at the northern cove. The entry area is usually a placid spot as it is well sheltered from the south west swell The long climb down the stairs and the long swim to the site require a reasonable level of fitness, but there is fresh water on tap at the top of the stairs and a few litres on your head and suit before the descent will keep you cooler. Cold water, Strong surge in gulleys and swim-throughs. Sea urchins. Strong offshore winds may develop over a short time. The site requires fitness if dived from the shore. The ability to navigate back underwater on a shore entry dive is strongly recommended. This page was last edited on 17 November 2010, at 08:26.